I have a strange relationship with golf. I enjoyed playing miniature golf as a kid on family outings. And I’ve even tried some regular golf and didn’t find it completely terrible. I still wouldn’t make it a hobby, though. And you wouldn’t be able to pay me to watch someone else play the sport. That said, I acknowledge that it translates well to video games, especially on mobile. It makes sense, as what’s better than swiping around a touchscreen to shoot a ball into a hole? So I like the idea of golf games, and I’m usually willing to give any number of them a try. But I get too easily frustrated when my ball doesn’t have the right amount of power behind it or the arc’s angle is slightly off. It becomes too much about trial and error, adjusting my stroke a little bit each time until I get it right. It can be rewarding if done well, but usually I just give up way before it gets to that point. Golf Club: Wasteland is probably the only golf game I’ve completed, and if you stripped away the artwork, atmosphere and soundtrack, that likely wouldn’t have happened. So when I saw Golf Peaks up for a pre-order, a puzzle game that uses golf mechanics, I knew I’d found a golf game designed especially for me. In Golf Peaks, there’s no skill involved whatsoever. You don’t have to worry about the power behind the ball or hitting the wall at just the right angle so it bounces off, loops around and lands in the hole. Instead, each level is broken up into a grid of tiles with a few numbered cards at the bottom. These numbers tell you how many tiles over the ball will move if you hit it. So you choose a card from those available and then swipe in the direction you want it to move. Some cards will also shoot upwards, so the ball can get up to higher ground or jump over a gap or body of water. The idea is to use the cards given and get the ball into the hole. There’s no way to mess up a shot, only to make the wrong shot. But there’s an undo button for those moments, and none of the puzzles have enough cards for it to even be an issue. Don’t assume that makes it easy, though. 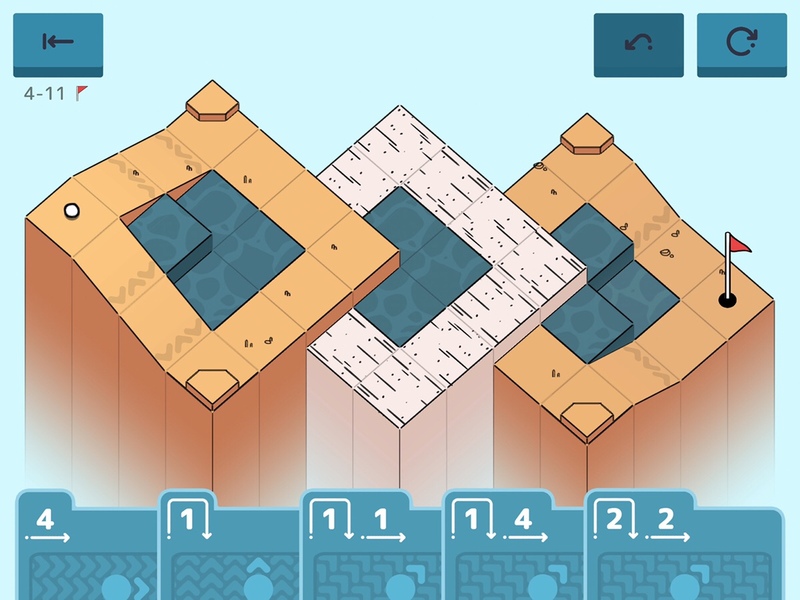 It’s a thoughtful, meditative game that has quite a few tricks up its sleeve. Things start off simple to show you the ropes. You learn that the ball can fall over the edge and that that’s bad. You can also hit a ball down a slope and it will keep rolling until it hits flat ground. Similarly, if you hit a ball up a slope and it doesn’t hit flat ground, it will roll back. You can also bounce the ball off a wall behind you if you have a 3 card and the hole is only two tiles away. Soon enough, you’ll see your ball getting stuck in sand and learn how to either avoid those tiles or use them to your advantage. Mud and water further complicate things, but not quite as much as the springboard tiles that push your ball upward. Combine all these tiles together and you get some tricky courses to work your brain around. It’s actually quite impressive how the game managed to stump me on a number of occasions with only a handful of moves per puzzle. Sometimes this is done through sneaky misdirection, making you think the solution is simple and straightforward when it’s anything but. Golf Peaks is a stylish and polished puzzler where the developer thought of everything to make it feel just right. It’s a premium game with no ads or IAPs and it respects your intelligence. It teaches through play instead of holding your hand and explaining how each tile works. There’s also iCloud sync for those with multiple devices, and it plays in portrait mode on iPhone, but landscape mode on iPad. So it makes a perfect one-handed game on the go or a lap game while relaxing on the couch. 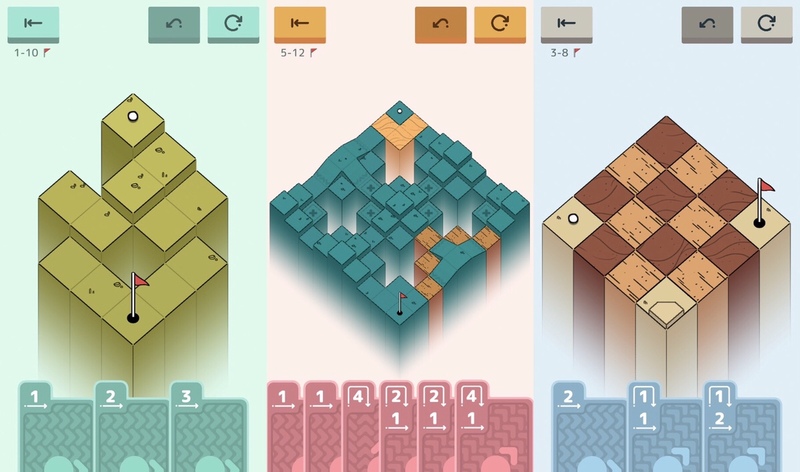 As with many of these tight, clever puzzle games that focus on quality over quantity, my only real complaint — besides maybe that the undo button is too high up — is that there isn’t more of it. I think this is a game that could benefit from a level designer or daily randomized levels. But I also appreciate the work that goes into handcrafting these puzzles so each and every one is worthwhile. There really isn’t anything more to say. 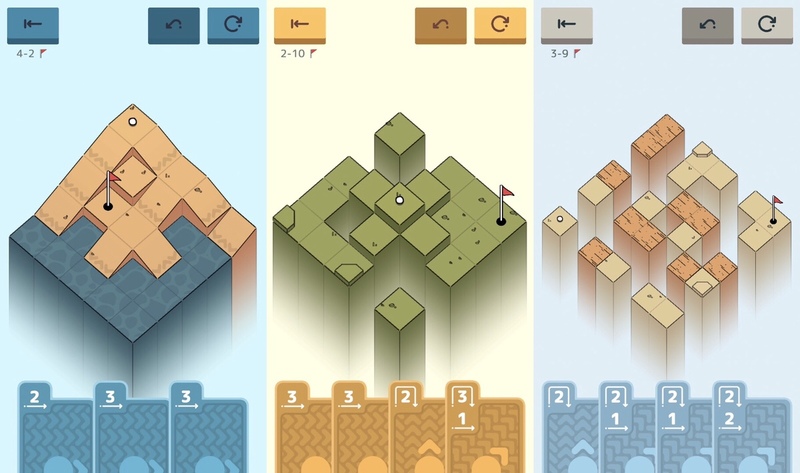 If you want an incredibly polished puzzler that was made with the platform in mind, you can’t go wrong with Golf Peaks. It’s a perfect relaxing but challenging game to spend a couple of hours playing on a chilly autumn night. It’s the golf game for people who hate golf, and it just so happens to also be a super smart puzzler. So don’t whiff out — grab Golf Peaks here and get on the green! And if you’re stuck on any of the puzzles, try my walkthrough guide.